This book is a gift, a wise and compassionate guide for those who undertake the difficult work of caring for the traumas of this world. Anyone who works with traumatized people can be caught in the grip of anxiety, irritability, or overwhelming sadness. By shutting out those feelings, you may sink into emotional numbness. You wish for wise words and a fresh perspective. You long for an understanding heart. You can find all that and more in Laura van Dernoot Lipsky’s terrific book. What could be more useful to a beleaguered trauma worker than this kit bag of straight talk, wisdom, practical ideas, and delightful doses of humor? 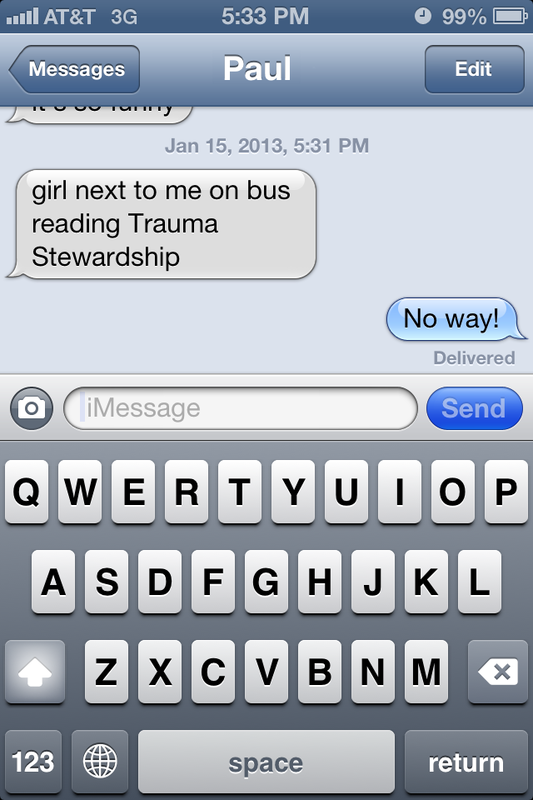 Trauma Stewardship can be read straight through or picked up as needed for 15 minutes a day. Either way, it will get you through the hard times. It will help you feel better and work smarter. No trauma worker should be without it. Laura makes a superb case for “trauma stewardship” as an approach that will benefit all of us in the service community who must deal with the struggles of our work with a hurting world. Her real-life stories hit home and clearly illustrate the ways that the traumatic situations we experience at work can carry over into our personal view of our world. Laura helps us understand our own responses to trauma and provides a path of renewal. Her book offers tools to bring us back to a place of balance where we can be more effective in our work, more present with our families, and most importantly, more at peace in our own soul. Laura van Dernoot Lipsky and Trauma Stewardship gave me language to describe what I was feeling after three trips to Iraq and subsequent work among U.S. service members struggling to heal from war. Trauma Stewardship helped me acknowledge that my pain was not weakness to be suppressed or anesthetized, but secondary trauma. But perhaps most important, Trauma Stewardship has shown me a path – not an easy one, to be sure, but a concrete one – toward a better and healthier life. Having been an attorney for only two years, I was both surprised and relieved to recognize many signs of “secondary trauma” in myself. Surprised because I had never been able to acknowledge the impact of my work as a public defender in such a way; relieved for the very same reason. I have come to rely on this book a means to help me bear the weight of what can feel like inexorable human tragedy. It is only through the practices articulated and encouraged in Trauma Stewardship that my spirit remains intact. Each person I represent is better served for my having used this book. I recommend it to every public interest attorney and law student. trivial, even self-indulgent. We willingly subordinate our own needs to those of the work and the world at large, often feeling gratitude for the opportunity to do so, then wonder why we’re so exhausted. Gently and insightfully, Laura nudges us toward the proverbial balance so that, in the end, we can both work and live more fully. Alternative-fuel-vehicle advocate and cofounder of Lightning Rod Foundation and Plug In America, featured in the film Who Killed the Electric Car? I saw a lot as a cop in San Diego and as chief of the Seattle Police Department. Looking back on my 34 years in policing, I only wish that Trauma Stewardship had been in my car or on my desk that whole time. Whether it’s bureaucratic sources of distress or the steady diet of traumatic situations encountered on the streets, Laura’s extraordinary book offers a lucid, insightful, often humorous, and always practical guide to the professional who has no choice but to deal with trauma. I can’t recommend it highly enough. Trauma Stewardship provides valuable advice for all those who toil for the betterment of society and the environment we share. Author Laura van Dernoot Lipsky’s lifetime of caring and service has given her powerful insights into those who have similarly devoted their lives to the greater good. She reminds us all to embrace the joy of connecting with the people and planet that we cherish and serve. This impressive book helps one to recognize the effects of trauma exposure everywhere: in ourselves, our organizations, and our society. Readers will be guided (gently) along an individual path of exploration, growth, hope, and recovery. I will be recommending it to everyone I work with. Laura is a weaver. She takes the harsh yet resilient fibers that are the stories of trauma survivors and workers, including her own, threads them together with common-sense advice, and creates a warm and soft blanket that comforts and protects. It is an important book because it reminds you to care for yourself as you care for others, and then offers practical tools for doing so. I wish I’d had this book when I first began my work with women and children experiencing domestic violence! It is extremely easy, especially as caregivers, to overlook our selves and our care. Laura takes us, the trauma stewards, on a journey of self-healing: her book’s humor will make you laugh; its tools will help make us whole. She reminds us that the work we do as caregivers not only impacts our clients but also deeply affects us. Trauma Stewardship provides us with methods to help us get in touch with habits and feelings that no longer serve us, our communities, or our work. A must-read for all those who understand that this work we do is sacred. In this groundbreaking guide to trauma stewardship, van Dernoot Lipsky shines new light on the care of the healers in the helping professions and provides a useful and loving guide to developing our ability to care for ourselves as much as we care for others. Anyone in the helping professions will benefit from the profound insights offered in this book.